There’s a lot to learn about cables. Before we go too far, we need to look at the parts of a cable and why they’re important. The center conductor, marked “D” in the above photo, carries all the voltage on a cable. It interacts with the other parts of the cable to form a complete system. Center conductors can be solid copper or copper coated steel. Solid copper is only important for cables that carry voltage because of something called the skin effect RF transmissions like antenna or satellite signals don’t go all the way through the cable, they just dance around on the outside. 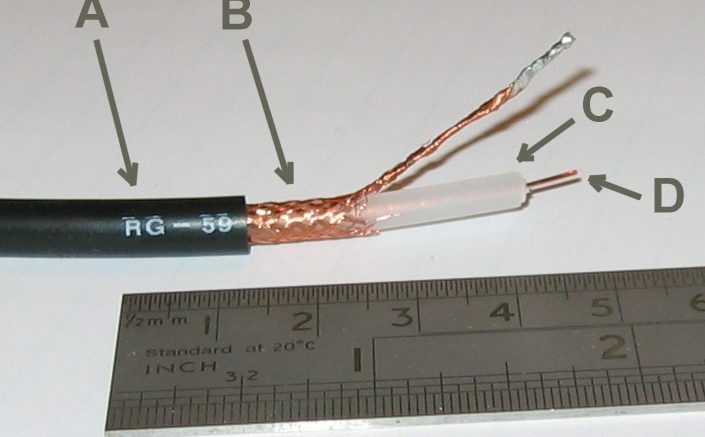 The dielectric, marked “C” in the above photo, is a critical part of the cable. It does more than just keep the center conductor from touching the outside shield. It’s a working part of the system because it’s made of a material that polarizes when voltage comes in contact with it. This property, known as the dielectric constant and the thickness of the material itself determine how far away the shield must be from the center conductor. Dielectric constant describes how well a material gets polarized, and because polarized materials are better insulators than non-polarized ones, it indirectly describes how good an insulator any material will be. The shield is the outer layer of metal, marked “B” in the picture above. In RG-59 cables, only a single shield is required, that is to say one layer of metal. Most RG-6 cables use a double shield, usually a solid sheet and a braided outer layer. Heavy duty cables use a quad shield, a sandwich of solid, braid, solid, braid that provides the most strength and protection. The shield provides a ground path for the wire as well as a basic level of protection. Properly built braids can add strength to a cable while keeping flexibility, and can actually provide better protection from stray magnetic fields than the thinner foil layer. The jacket, marked “A” in the picture above, adds structural rigidity to the cable as well as protection from the elements. The more you learn about electricity, the more you realize that it’s hard to explain. Still, here’s a very basic description of how electricity works. It’s important because the signal in any cable is just a series of electrical impulses. The easiest way to understand electricity is to think of it like water. When you turn on the tap, the amount of water you get is dependent on the size of the spigot, the size of the water pump, and whether or not you have a clogged screen at the end of the faucet. There are a lot of terms but we’ll concentrate on the ones that really matter to a cable. Volts, simply put, are what pushes the water. Ohms are a measure of resistance, that is to say how well something flows through something else. Something with a higher resistance will be harder for electricity to flow through. Current is a measure of “the big picture.” How much electricity is actually flowing? It’s measured in amps. Parts of a cable like the dielectric have capacitance which is roughly like a sponge placed inside a pipe. Something with capacitance temporarily stores current and gives it back later. Because nothing is perfect, not water pipes or coaxial cables, there is always loss. Loss happens all the time, but obviously there is more loss as cables get longer. Cables, as well as other parts of the system, have their losses measured in decibels or dB for short. If you add more water to a system, that’s gain. Same thing with electricity. A positive gain is a negative loss, and a positive loss is a negative gain. An amplifier adds electricity to a system and introduces gain. The signal inside your cables is measured in volts. Changing those voltages by a tiny little bit is what makes it possible to carry information. Everything that carries electricity has an impedance measured in ohms. For residential systems, everything has an impedance of 75 ohms. If impedances don’t match up, electricity can get “backed up” and this can cause all sorts of problems. Looking at a cable, you should know how much loss it has over the length you want to use it. In the next article, we’ll talk about the connectors on the end of cables and why they are what they are. Should you worry about repairing an indoor antenna?